Cambodia is located in Southeast Asia, and is bordered by Vietnam, Laos and Thailand. 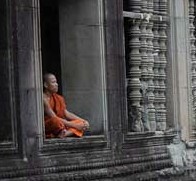 Though the country has seen rough years, Cambodia has now stabilized and has become a popular destination. From beaches to cultural and adventure travel, Cambodia has a lot to offer. Top destinations include Sihanoukville, a beautiful beach destination, or Siem Reap, which is home to Angkor Wat, a former a stunning Buddhist temple complex which is the largest religious monument in the world. When shopping for jewels in Cambodia, here's how you can outfox the gem scammers. At the Peace Art Project in Phnom Penh, Cambodia, Sasha Constable turns former weapons of death into beautiful art. Landmine Survivors Network founders Ken Rutherford and Jerry White have gained worldwide attention for the victims of landmines. Cambodia is the perfect classroom when it comes to photography and cooking classes. A local girl makes an unforgettable impression in Cambodia.